Granite guide ways of highest quality secures high thermal stability, precision and mechanical rigidity. Through the high precision of the guides and the high quality of the surfaces the air consumption of the air bearings is minimised. Completely encompassed guide ways optimize the repeatability of the measuring results. Two hand wheels in each axis, permit a fine positioning in all three axis. The big wheel allows the operator a fast positioning of the CMM. Double passive vibration damping is integrated in the support frame as a standard. 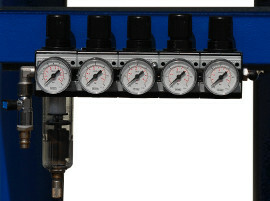 Manometer for each axis for easy maintenance. manual, swingable probe head with M3 thread. Must be recalibrated after turning and rotation. 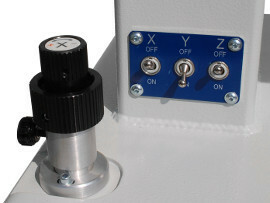 manually adjustable probe head which is indexable in 15° steps. The head is capable of carrying the full range of TP20 modules, which can be changed without re-qualification. Measuring of geometrical elements with graphical analyses. All the elements are displayed on the screen. Generate inspection reports automatically with text and graphics. No CAD import available. CAD import available. Measuring of geometrical elements against CAD model. 3D graphical display of all measured and nominal features. Graphical stickers with results can be displayed automatically. DELL PC, newest configuration, WINDOWS 7 professional, 22" TFT monitor, "ALL IN ONE" colour printer. Stylus M2 (MH20i) / M3 (TP8), Ø3, L=30, steel.